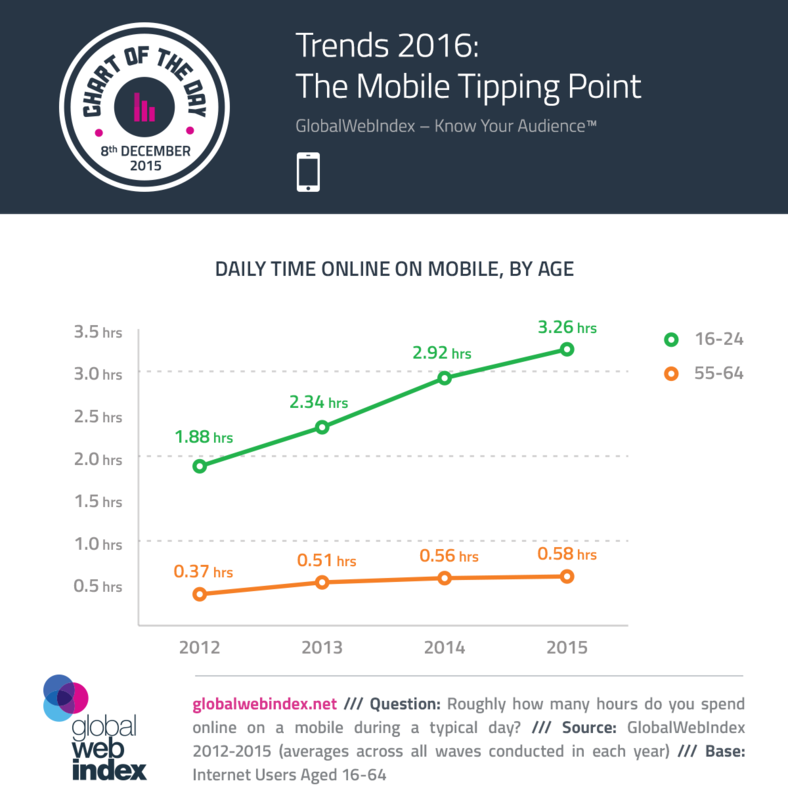 Today's Chart of the Day concludes our preview of GWI’s Trends 2016 report by considering what we’re calling the Mobile Tipping Point. This week’s final Chart of the Day concludes our preview of GWI’s Trends 2016 report by considering what we’re calling the Mobile Tipping Point. Look at GWI’s trended data on device usage and there’s one particularly striking landmark on the horizon: by 2018, 16-24s globally will devote more time to mobiles each day than all other devices combined. Currently, 16-24s are already spending an average of over 3.25 hours per day online on a mobile, representing an increase from just under 2 hours back in 2012. Look instead at the oldest group of consumers in our research – the 55-64s – and the picture is quite different; this group spends just over 30 minutes per day online on their mobiles, with the figure having crept up only very slightly over the last few years. It’s this demographic pattern which has a strong knock-on influence over Mobile Tipping Points at a country level. At the very forefront of the transition are fast-growth markets where internet penetration rates tend to remain relatively low and where online populations therefore have a younger age profile. The Middle East and Latin America are particularly prominent here, with Saudi Arabia being the first of GWI’s 34 countries to see the shift happen in 2016. While we’ve long talked about mobile-first or mobile-only consumers, it’s clear that these groups are about to get still more important – with fast-growth countries leading the charge. You received this email because you are subscribed to GlobalWebIndex.